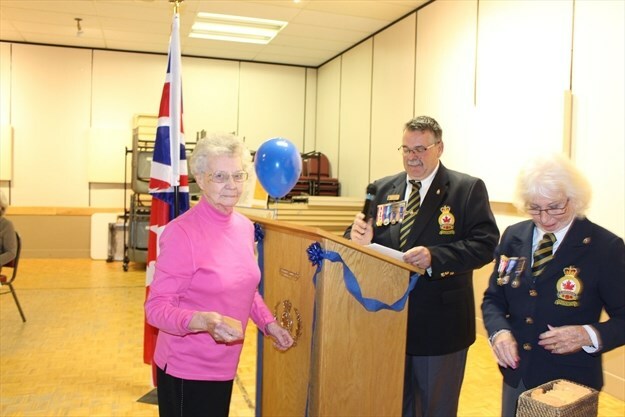 WW II Veteran Comrade Terry O’Brien presents to President Sheila Latner Waterdown, Ontario Branch, a collection of badges covering the infantry units that were part of the 14th British Army in Burma. They will proudly be displayed in our branch. Prior to our 11 November Remembrance Service Waterdown, Left to right; President Sheila Latner, Branch Service Officer Bob Thomas, Pastor Brian Willison from Grindstone Church, Dave Lester, Hamilton Parks Dept, Christopher Redford, Hamilton Hertitage Dept. and Councillor Judi Partridge, City of Hamilton Ward 15. 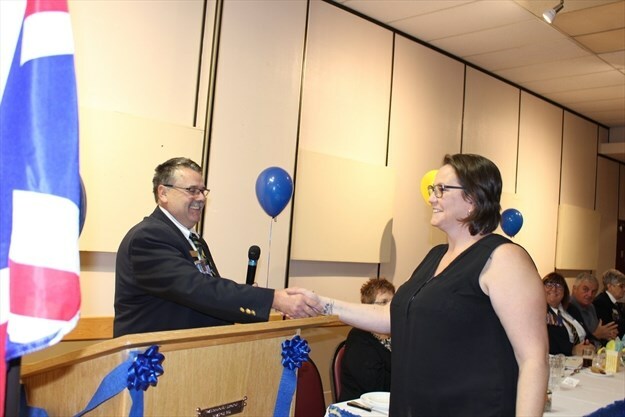 Cathy Galus, Executive and Poppy Chairman and Bob Thomas 1st Vice, Service Officer presenting a cheque of $3000.00 from Poppy Fund Waterdown Legion Branch 551 to Capt. 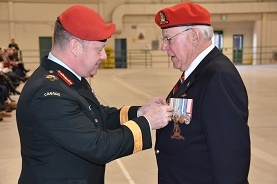 Howard Scrimgeour, CD and Cpt. 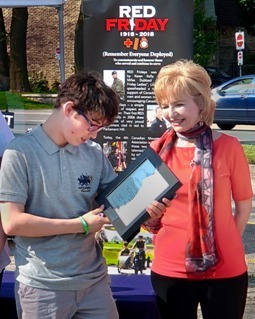 Sandie Vermeulen CD from 62 RHLI Army Cadet Corps. 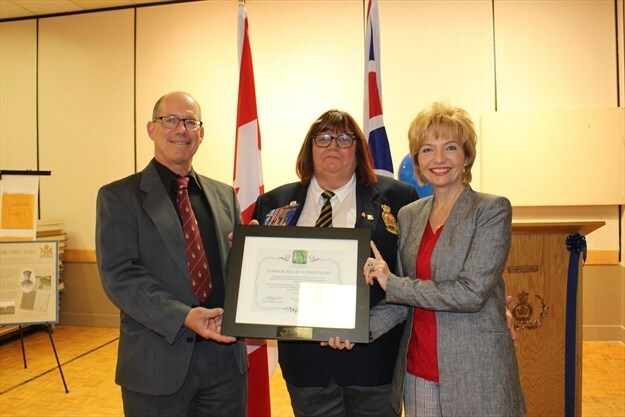 2nd PhotoLeft to Right: Wanda Chevrier (Waterdown Scouts receiving cheque of $2000.00 from Bob Thomas, 1st Vice, Service Officer, and Cathy Galus , Executive and Poppy Chairman on behalf of the Waterdown Legion Branch 551. Lots of great costumes and so much fun!!! Vimy Ridge oak tree commemorative plaque that will be unveiled Nov. 11th. 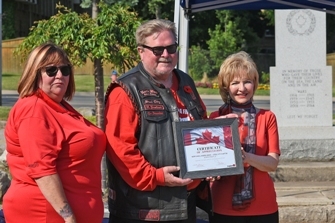 On September 10, the North West Riders donated $250 to the plaque for the Vimy Oak Tree. 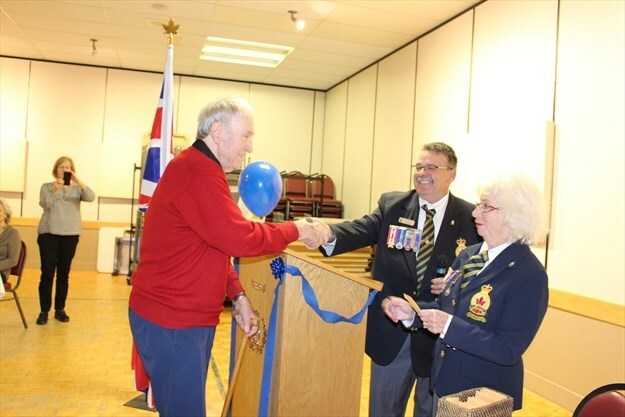 Their work and dedication is greatly appreciated by the legion and the surrounding community. On September 6, Iva and Howard retired from hosting the Fiddlers Jam Session after 13 wonderful years. 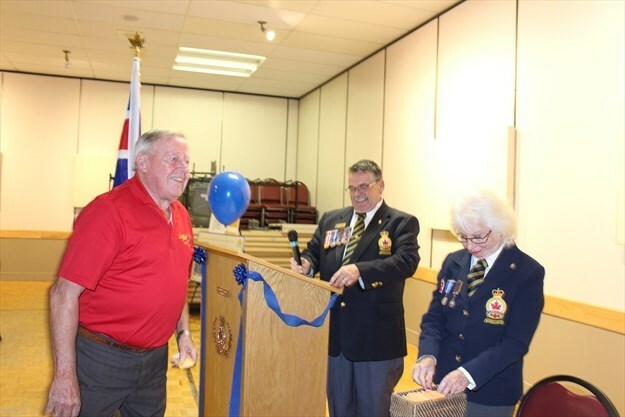 They were presented with gifts, a visa card, cake and flowers in appreciation of all their hard work and dedication to the legion. 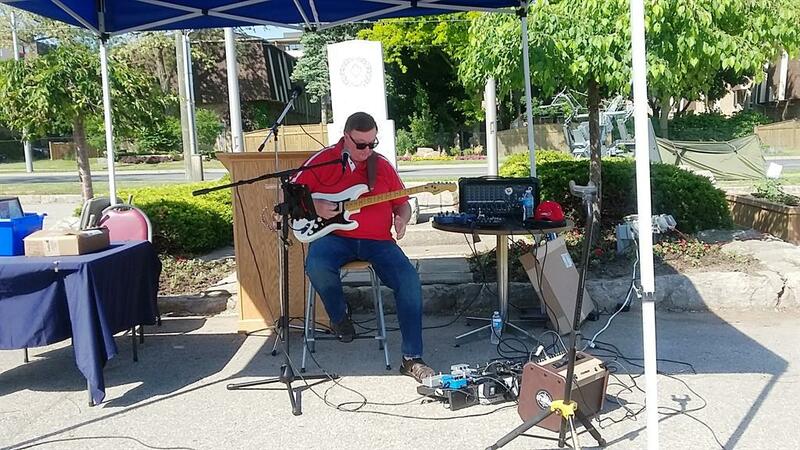 Drew and Kathleen Hawkyard will be continuing on in their footsteps hosting this event every Thursday afternoon at 1:00. Everyone had a great afternoon. 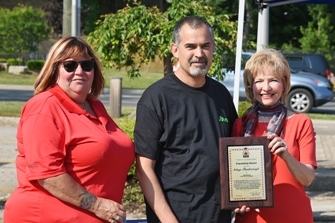 North Wall Assosciation & John Hunter of King Paving receiving Friendship award. Hello: My name is Laura Oros and I live in Waterdown. I just want to say a little thank you for something. My young son Daniel bought flowers for the 2017 Remembrance Day Service and as everyone was laying a wreath he walked out of the group and chose to lay a bouquet at the little sapling for those who were at Vimy. He was amazed at the sapling and wanted to pay respect to the memory. Every day we drive by and notice they have weathered the cold winter and are still there. He says it is symbolic of how those who served never gave up and battled through bloody fighting for us. So I wanted to say thank you for leaving them there, you may not have even noticed but we have seen them and feel gratutude daily. You made a boy very happy. Kindest regards, Laura Orus. June 10, 2018. 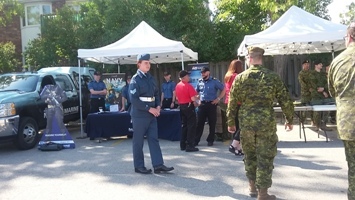 Branch 551 has been a sponsor of Red Friday with the 4th Canadian Mounted Rifles Association (4CMRA) for over a year at the time of writing. 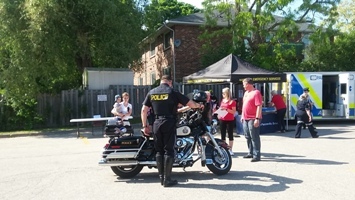 The 4 CMRA brings the national focus while branch 551 brings a local venue where we can stage events and where First Responders can meet and enjoy the same comradery that the legions are famous for with their veterans. 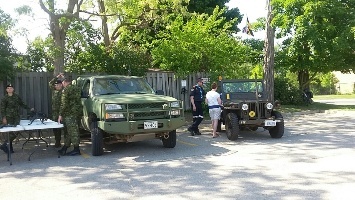 One of the main drivers, and visionaries, at branch 551 is Robert Thomas, veteran and friend of the 4 CMRA, Bravo Zulu Robert. We are looking to a bright future for Red Friday and adding more First ponders and legion branches to the Red Friday Family! 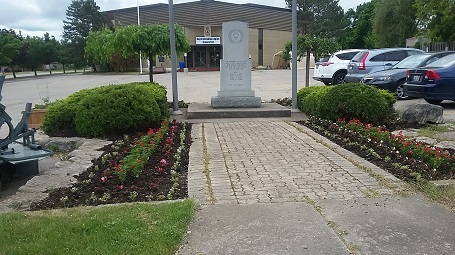 Scott Fillman doing volunteer planting of the Legion Cenotaph on June 2,2018 and making it look great! Horticulturist Arie Vanspronsen and Waterdown Legion Veteran officer Bob Thomas with their Vimy tree, planted at the branch. - Barry Gray,The Hamilton Spectator. 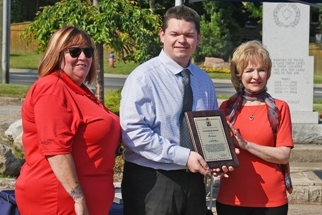 A two-metre sapling that is a direct descendant of the English oaks at Vimy Ridge is the only tree in Hamilton to receive heritage designation. casualties in the Battle of Vimy Ridge. 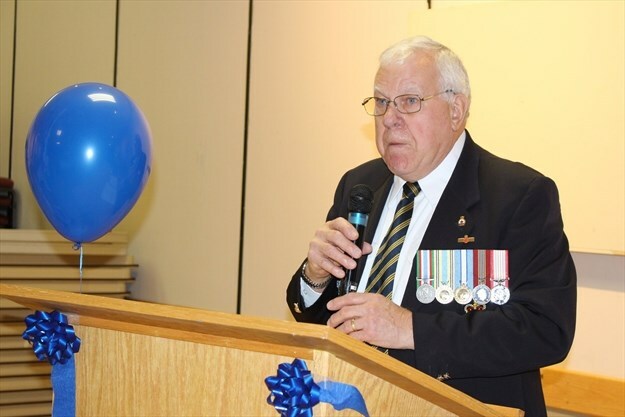 "We're just so tickled pink to have it," said Bob Thomas, third vice-president and veteran s' officer at the Legion. "Hopefully it will be a memorial for many years to come for all those who fought in our area in World War I." The story of the trees stems from acorns collected by Canadian soldier Leslie Miller, who survived the First World War victory won by Canadian troops April 9 to 12, 1917. After picking up the acorns scattered around an oak tree destroyed by shelling, Miller who died in 1979 — sent them home.where they grew into a forest Chinese Baptist Church. 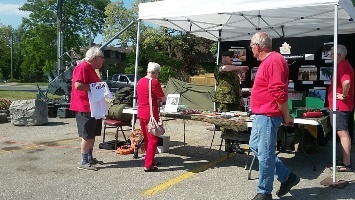 Conveniently, the Legion was planning an event in June to commemorate the 100th anniversary of Vimy Ridge. 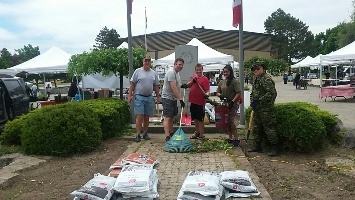 They were able, with the help of the horticultural society to get the sapling in time for the event at which the tree was planted just east of the Legion's sign. For the 100th anniversary of the Battle of Vimy Ridge, efforts were made to grow offspring trees by grafting hundreds of branches from the tips of the trees to sapling of English oaks from British Columbia. 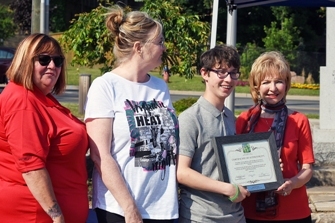 Thomas reached out to the Vimy Oaks Legacy Corporation, where he had to apply for a tree, and received his approval within 24 hours. Conveniently, the Legion was planning an event in June to commemorate the 100th anniversary of Vimy Ridge. They were able, with the help of the horticultural society, to get the sapling in time for the event at which the tree was planted just east of the Legion's sign.For the 100th anniversary of the Battle of Vimy Ridge, efforts were made to grow offspring trees by grafting hundreds of branches from the tips of the trees to saplings of English oaks from British Columbia. The work was done at Connon Nurseries NVK in West Flamborough in 2015. The work was done at Connon Nurseries NVK in West Flamborough in 2015. 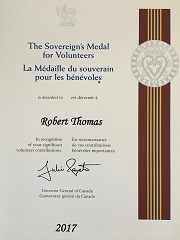 The Sovereign’s Medal for Volunteers was presented to Bob Thomas at the Canadian Forces Military Police Academy at the Graduation Parade on December 13, 2017. 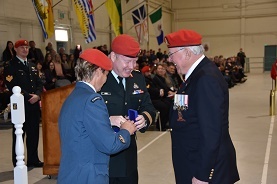 The medal, which recognizes exceptional volunteer achievements, was presented by Canadian Forces Provost Marshal, Brigadier-General Rob Delaney, OMM, CD, and Chief Warrant Officer Crystal Krammer, MMM, CD. 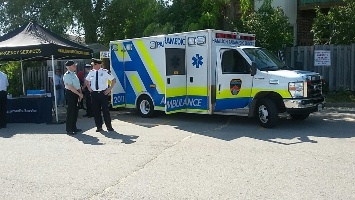 Donna Green would like to thank all the volunteers who helped make our Annual BBQ & Corn Roast a success by donating their time, efforts and products. To everyone a very big “Thank You”. 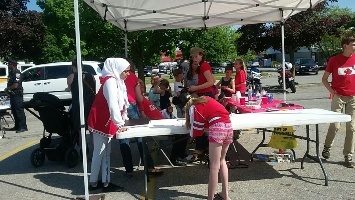 A special thanks to all members of our Branch who volunteered to help at our event to mark the 100th Anniversary of Vimy Ridge. 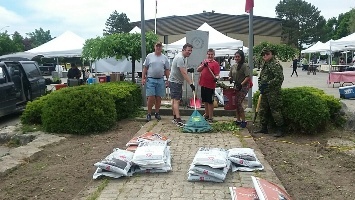 The groups that articipated had an enjoyable afternoon and evening and many members of our community have a better understanding of our WW I Military History.We also planted a Vimy Oak Tree. The following is a brief history covering the heritage of these trees. The Battle of Vimy Ridge in northern France, 9 April 1917, is considered to be one of the defining events in the history of our nation. Where Allied troops had struggled and failed, the Canadians overcame great odds and eventually captured the Ridge at a cost of some 10,600 casualties. After the battle, Lieutenant Leslie Miller of Scarborough, Ontario gathered up a handful of acorns from a partially buried English oak on the Ridge. He sent the acorns home to is family with instructions to plant them. In 1919 Lieutenant Miller returned, was given a 25 acre section of his father’s Scarborough farm and transplanted the oaks along the borders of his woodlot. 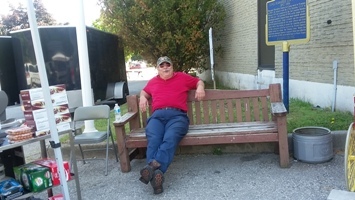 He named his farm “The Vimy Oaks”. Today, a number of these majestic oaks are thriving in the same but smaller woodlot under the close care of Scarborough Chinese Baptist Church that purchased the farm property in 2002. 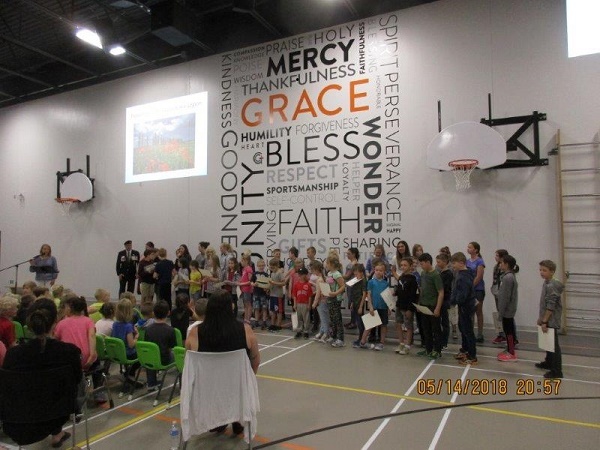 In January 2014, a group of volunteers, the “Vimy Oaks Legacy Corporation”, decided to repatriate offspring of these descendant oaks back to Vimy Ridge, whose oak trees had all been destroyed in the First World War. These Vimy Oak saplings will be planted in the Vimy Foundation Centennial Park, adjacent to the Canadian National Vimy Memorial site, as part of centennial commemorations in France in 2017 and 2018. The Vimy Oaks Legacy Corporation made some of these saplings available for sale to qualifying organizations to honour the soldiers who fought at Vimy Ridge and other battles during the First World War and we are proud to have one.